Pictured is the labyrinth located on the Ohio Wesleyan University campus in Delaware. This week, we bring those three powerful persons back together in a creative way: the prayer labyrinth at Ohio Wesleyan. Over the past few days and into this weekend, Ohio Wesleyan is hosting its first series of workshops to equip community members and area churches to more deeply utilize the OWU labyrinth as an instrument for prayer and reflection. 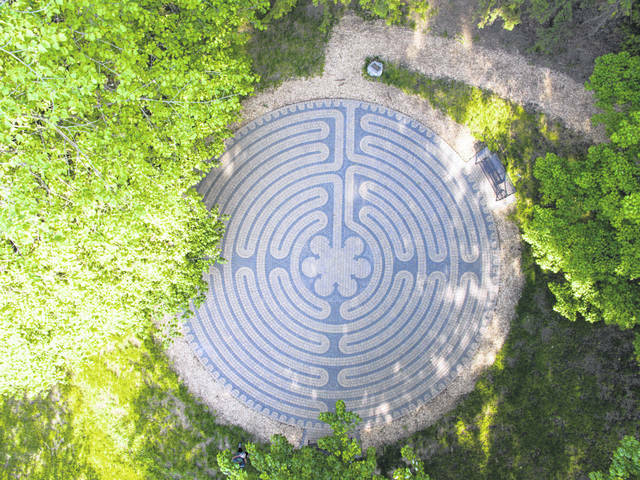 The OWU labyrinth replicates the labyrinth at Chartres Cathedral in France. It is a gift from the family of OWU alumna Kathe Rhinesmith, and she herself is the faculty trainer for our workshops this week. A labyrinth is basically a circular spiral path folded back in on itself as a means of prayerful meditation. Christians have used this pattern of walking around in circles for nearly 2,000 years. This meandering meditative path has been found over the centuries to be an amazingly powerful tool for Christian prayer: to quiet distracted or overactive minds; calm disturbing emotions or unfortunate events in life; resolve inner discomfort; still one’s mind enough to get clarity for whatever it is that is going on in one’s life; but most importantly to help one ponder the power of God’s greatest mysteries of life to enhance healing – emotionally, mentally and spiritually. “I need Your sense of time, O God. I have an underlying anxiety about things. I am in a hurry to achieve my ends, completely without patience. It is hard for me to realize that growth is slow, not all processes are swift. I cannot discriminate between what takes time and what can be rushed; my sense of time is dulled. O to understand that I may do all things with a profound sense of leisure of time. “I need Your sense of order, O God. The confusion of details is overwhelming; little things get in my way: ready-made excuses for failure to do and be what I know I ought to do and be. Much time is spent on things not very important while significant things are put in my scheme of order. I must unscramble my affairs so my life will become order. O God, I need Your sense of order.